Taste, Texture Strong fishy flavour, oily. Fine texture. Slimy Mackerel can be found around rocks, wharves and jetties in bays and inshore as well as offshore. Blue Mackerel can also be caught using imitation fishing flies and small baitfish flies, metal lures, soft plastics and other small lures. One of the easiest ways to catch Blue Mackerel is using a light hand line with a small hook, you don't have to weight the line, but you can use a small lead running sinker if you want. Blue Mackerel is usually sold whole, gilled and gutted. The meat is dark and has a strong flavour, moderate to high oiliness and a dry firm flesh with large flakes. It is excellent smoked, can be wrapped in foil and baked or barbequed. 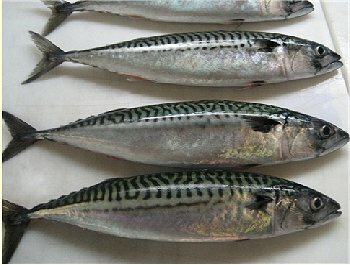 Recipes for mackerel. Blue mackerel (Scomber australasicus) are caught commercially by small purse seines for use as both live and dead bait in domestic tuna fisheries. Blue mackerel occur off all states of Australia except the Northern Territory. The species inhabits inshore and continental shelf waters, with older fish occurring further offshore. Commercial landings of blue mackerel since the mid 1980s have generally been between 300 and 500 tonnes annually but show considerable fluctuations. These fluctuations are likely to reflect changes in stock availability due to recruitment variability and may also reflect changes in the distribution of fish due to oceanographic processes. Buyers, processors and sellers of Blue Mackerel Scomber australasicus are listed. Australian fisheries statistics Australian Government, Department of Primary Industries Wild Fish Research Program Blue Mackerel information, Sea-Ex Trade Seafood Industry Directory companies and contacts for Exporters of Blue Mackerel, Importers of Blue Mackerel, Processors, wholesalers and Seafood Agents of Blue mackerel listed.